Palestine is unusual in the history of nations—it has been under military occupation for 55 years, its people undergoing constant persecution and torture, while the rest of the world has simply stood by and watched. There are four and a half million Palestinians living in Palestine, yet you cannot find it on a map. You may wish to call someone in Palestine – say, in Gaza -- but not be able to find an international code in the phone book. You may wish to mail a letter to Palestine, but the post office clerk will tell you that there is no listing for this country. There are five million refugees from Palestine, yet they belong neither to the country they’re in, nor the country they came from, because it isn’t recognized. A political movement known as Zionism, which began at the end of the 19th century, has been busy sweeping away the history of the people of Palestine since it first attained power, first with a supposed mandate from the Bible that said the land was theirs, then with a mandate from Britain, tired of its imperial role there, who actually gave it to them. The Zionist’s motto then was “a land without a people for a people without a land.” Since the land was not “without a people” – since, in fact, Palestinians had been living in their own land for as much as ten thousand years – a good deal of map burning, book burning, dynamiting, bulldozing, imprisoning, and genocide had to be carried out.. American mendacity coined the phrase -- “the peace process” – to describe it. It is much like the process that established the present-day U.S.A. – genocide, theft, broken treaties, and warfare with an indigenous people, followed by a system of “reservations,” eradication of culture, and co-opting of those aspects of the indigenous culture considered quaint. Zionists claim felafel as their national dish just as North Americans, testing the limits of perversity, names attack helicopters “Apache.” To close the circle, those helicopters are now used in vicious attacks on unarmed Palestinians in their homes eight thousand miles away. Battles, wars, and political regimes may come and go, but what lasts is the culture of a people. The culture of the past hundred years in Palestine has been one of resistance. 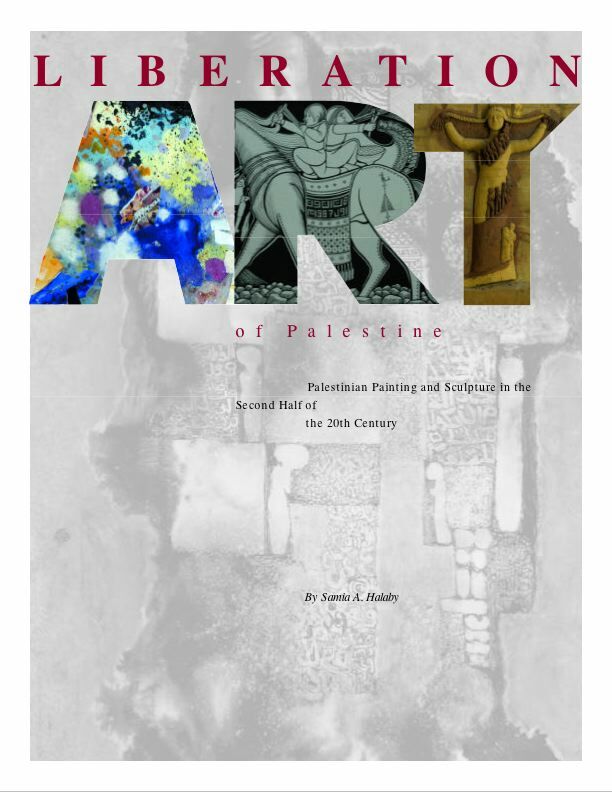 Samia Halaby, an artist and teacher who was born in Palestine, has made a record of this culture and this resistance in her new book, Liberation Art of Palestine. In doing so, she has saved an important part of the history of Palestine from being erased. Her book documents the progress of Palestinian art through the era of the British Empire; the “Nakba” or “catastrophe” of 1948, when, through a series of massacres and forced expulsions, Israel declared itself a state; the 1967 war; the first Intifada, of the 1980’s; and the second, or “Aqsa” Intifada, which began in 2000 and is ongoing. The story of fan al muqawama (the art of resistance) during this century is the story of the Palestinian people. This story seems better learned through art than through a typical political history. It tells the story of the artists one by one – what their experiences were, what inspired them, what their families went through – so that we can identify with them. The biographies are accompanied by 62 beautiful color plates showing the work of these artists, the traditions they came from, the faces, heroes, figures, and symbols which are part of Arab culture and Palestinian resistance. This book is history told through art, and the lives of the artist. One such story is that of the author herself, Samia Halaby, who was born in Al Quds (Jerusalem) in 1936 and grew up in the city of Yafa on the Mediterranean. She and her family escaped Israeli terror in 1948, fleeing to Lebanon, then the United States. The area of Yafa where her home was is now a tourist spot occupied by boutiques, expensive apartments, and fashionable restaurants—with nobody in them. Here, as in many other places, a thin veneer of colonial-settler culture covers up thousands of years of history, and a recent, very ugly, past. Halaby tells the story of another artist, Abdul Tamam, of the village of Kafr Qasem who “was inspired to begin painting through his intense reaction to oppression. He devoted his artistic work to the Kafr Qasem massacre of 1956, during which Israeli forces murdered some members of his family, with 49 other victims. Abdul Tamam spent many years in prison and lost much of his early work to Israeli confiscation directly as a result of treating the theme of the massacre in his painting.” The narrative goes on to say that “the residents of Kafr Qasem have not forgotten the massacre and mark its date with an annual march. Everyone in Kafr Qasem participates. . . One particular phrase is included in narratives of the massacre: the order to the Israeli border guards to kill the villagers returning home from work. Tamam’s ink drawing, Harvest Them, 1999 records this order to kill, which has been burned into Kafr Qasem memory. In the drawing we see a group of women and children huddled together, surrounded by barbed wire, and confronted by headless soldiers aiming guns at them.” The drawing is included, with two other works by Tamam. Another example of the history of Palestine being told through its art is an ink drawing titled Rabin Policy: Breaking Bones by Gaza artist Fayez Sersawi. The drawing depicts a soldier with a rifle strapped to his shoulder and a black club raised in the air. The soldier is beating two children, lying on the ground, their limbs flailing. The drawing refers to Prime Minister Yitzhak Rabin’s attempt to end resistance in the first Intifada by ordering the Israeli Defense Forces to “break the bones” of Palestinians -- mainly children in the streets of the villages of Palestine. Brutal as the picture is, it seems quaint by today’s standards, when the IDF, instead of patrolling the streets on foot, with clubs, now murders Palestinian children outright with sniper rifles from the safety of a tank turret or armored personnel carrier. What guns will conquer is often short-lived. There are many examples of this in the history of colonialism. But memories of oppression are hard to eradicate. People tell the stories from one generation to another; writers create books; artists draw pictures. Even these may be destroyed, but not altogether, and no empire has the resources to prevent new representations from being made. A land may be occupied, but people who have lived on that land for thousands of years cannot simply be erased. Resistance will confront the oppressor by day, and haunt him at night. This is the story of Palestine. Liberation Art of Palestine provides both words and pictures of Palestinian resistance. It is itself an example of this struggle.